A unique opportunity to study in Brazil – the World’s 5th largest economy, and arguably the most ecologically diverse country in the world. Brazil is a veritable mecca for culture tourists, academics, artists and eco-travelers. Successful candidates will obtain full scholarships for post-graduate studies, and tuition scholarships for undergraduate studies. The prerequisite 6-month language proficiency course which starts in October 2015 also offers entrepreneurs and other business professionals the chance to broaden their business horizons to include Brazil, Portugal, Angola, and other Portuguese-speaking countries in Africa. 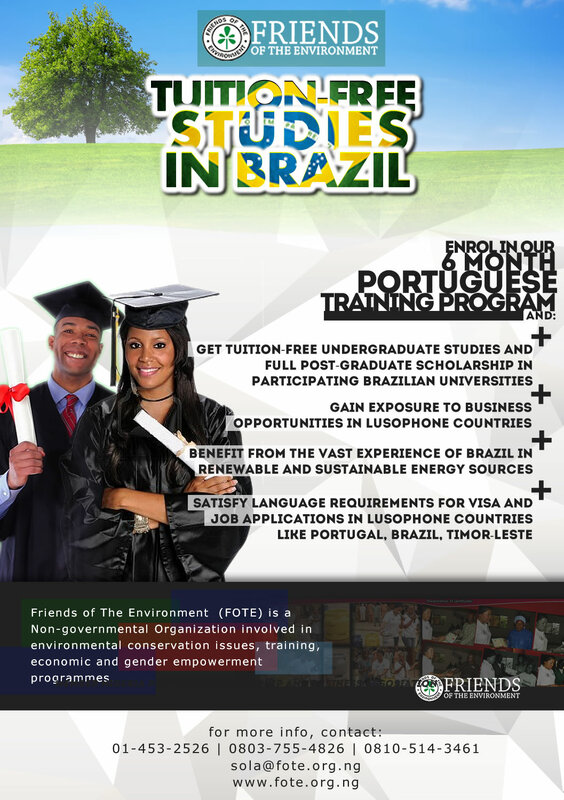 To view a list of participating Brazilian universities and the courses they offer click here. The training fees are payable once or half and then quarter twice, all prepaid. The fees are inclusive of the Celpe-Bras exam registration fees and learning materials. Registration starts 17th of August. View the List of Participating Universities & Offered Courses. I am interested in studying in Brazil., but that will be next year as I will graduating this year.would like to know if there's any February intake..thanks. my name is as stated below, i am an accountant working full time in Lagos, Nigeria. How can i be accommodated in this your language program. I visited Brazil last year and i like the place. I will like to travel again but using your program as a vehicle. kindly let me know how you can accommodate me being a full time worker. Where is the training taking place ? I would like to participate, but am a Corper serving in benue.. The location is an issue. You said selected candidates.. That's scary. This full scholarship does it include accommodation?